The Spanish Trail – Part One. Welcome to the first part of our Spanish Trail. A 1.350 kms journey through Spain’s northern regions. Catalunya, Aragon, Navarra, La Rioja, Soria and Burgos are on our menu, in this mountainous section. 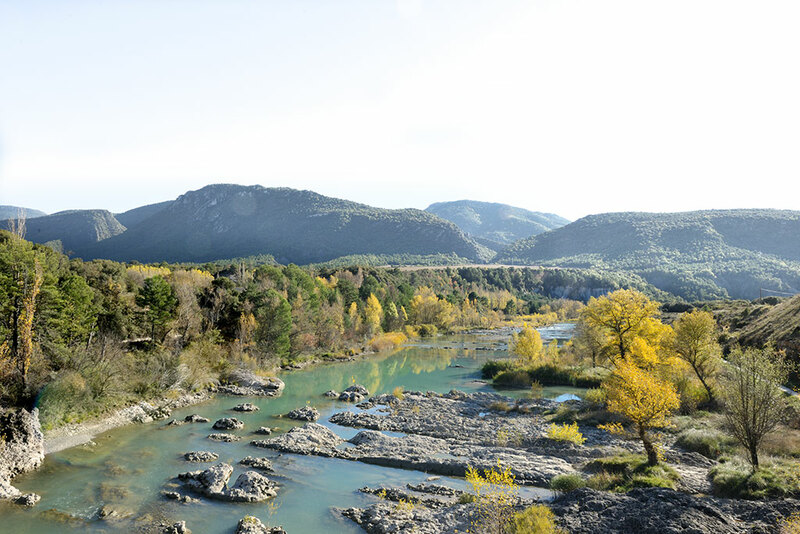 The Pireneu and the Sistema Iberico, separated by the Bardenas Reales desert and the Ebro valley, will offer a vast array of natural wonders for you to see, punctuated by scenic traditional villages and architectural landmarks. You’ll witness ancestral rural traditions, taste simple but nevertheless delicious food, observe wild life, enjoy thrilling water adventures while exploring deep canyons, or learn about the rich local history while visiting some of its famous monuments… This trail is taking you to places that don’t necessarily come to mind when thinking of Spain. So open your eyes and get ready to be impressed ! Available for you is the Google Earth .KMZ file you’ll need to open in Google Earth to properly visualise this trail. From there you can transfer it to your favourite GPS device. To open it, go to GOOGLE EARTH, click on FILE, then OPEN, go to DOWNLOADS, and select SPT-01. Please click on the link below to download the trail. 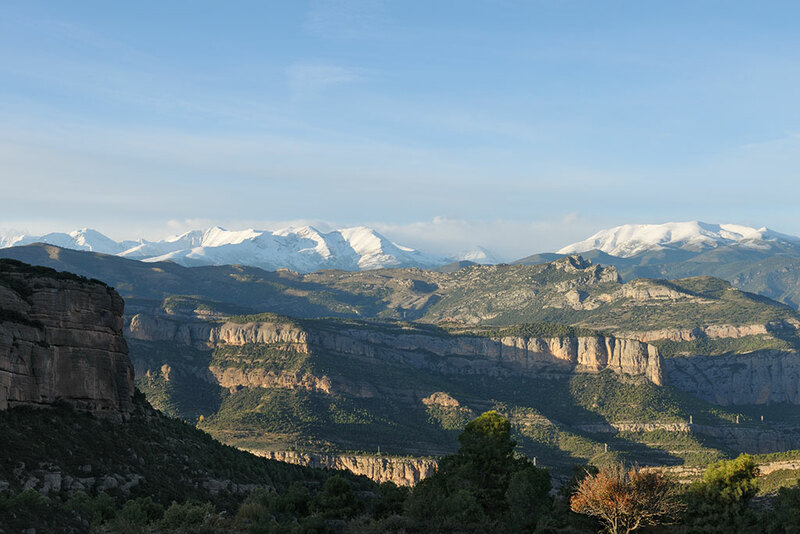 This first part of our Spanish trail is all about mountains, and between the Alt Pirineu and the Sistema Iberico, you’ll spend most of your days going up and down, from one gorgeous valley to the next. 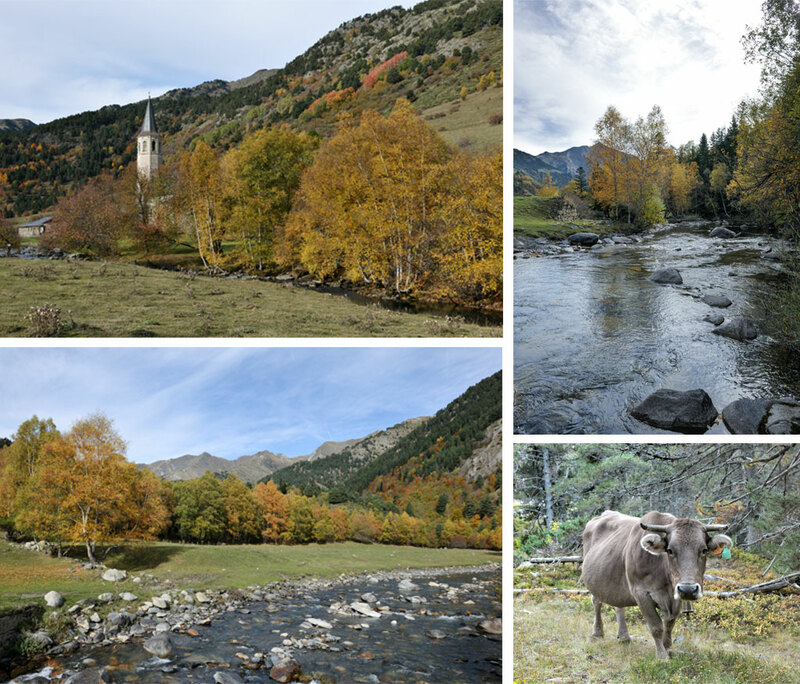 The Alt Pireneu (High Pyrenees) form a natural frontier between the Iberian peninsula and the rest of Europe. Rising from the ground some 100 to 150 million years ago, they extend from the Atlantic Ocean and the Bay of Biscay, all the way to the Mediterranean Sea. Historically home of the Kingdoms of Aragon (which included at times Catalunya) and Navarra (which included the Basque country), each stretching over on both sides of the range, it is now split in the middle between Spain and France, the Spanish side divided between the Euskadi (Basque) region, Navarra, Aragon and Catalunya provinces. 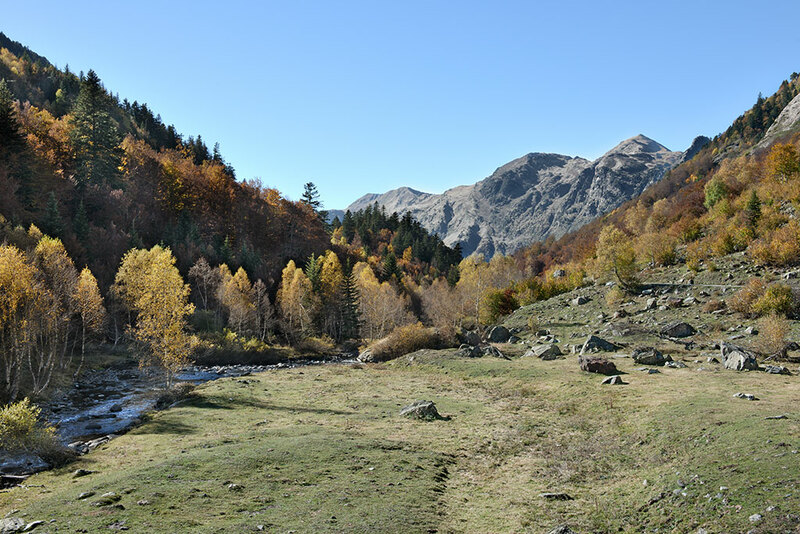 Older than the Alps, not as high in altitude, and as such less polluted with lavish ski resorts, the Pyrenees display a far greater variety of natural landscapes and boast a far more diverse and well preserved collection of rural habitats for us to explore. 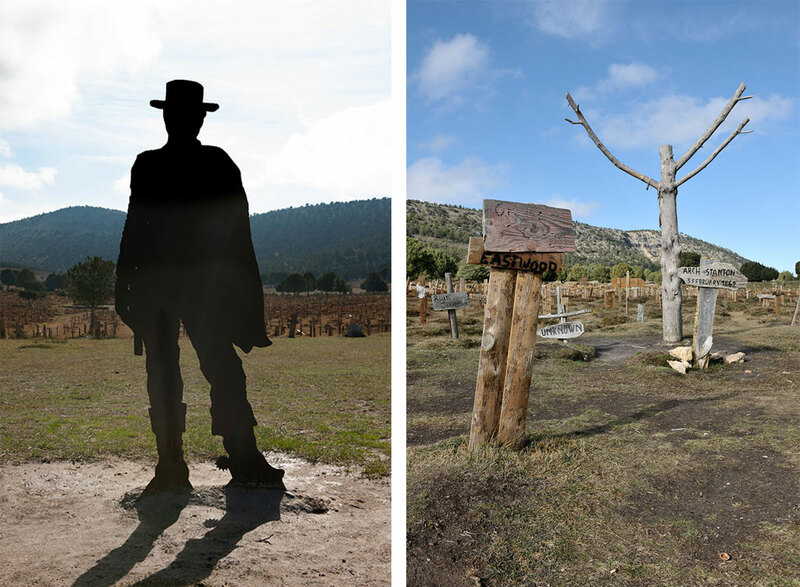 Concentrating on Catalunya, Aragon and then Navarra, the trail wends through the forgotten pastural communities, showing us the remnants of a way of live many have deserted long ago, victims of the fake promises of modernity. It is also home of two must see natural parks, the Aigüestortes and its lakes, and the Sierra y Cañones de Guara and its canyons and “Mallos”. Two natural treasures deserving all your attention. Separating this first barrier from the next, are the Bardenas Reales of southern Navarra, sitting at the mercy of the winds along the Ebro valley. This miniature desert will transport you far from Europe for a few hours, as it evokes the arid landscapes of the Middle-East or the American West, a welcome hiatus in our mountainous adventures, as we soon after start climbing back up the second range of this trip, the Sistema Iberico. This lower range is all about water, as many of the main rivers of the peninsula originate from those rock formations. Here, you’ll find peace and solitude, a zen like feeling while lost in preserved wilderness, as with the long exodus of the local population, forests have slowly recovered the old pastures, and animals retaken their rights on their former habitats. Go slow and open your eyes, as beauty is all around. Finally, as we return to the plains of Castilla y Leon, on the other side of the Sistema, begins the last facet of our journey. A ride through history, a place where collided two religions, two civilizations. A deadly opposition between the Christian kingdoms of the north and the Muslims conquerors of Al Andalus, coming from the south. 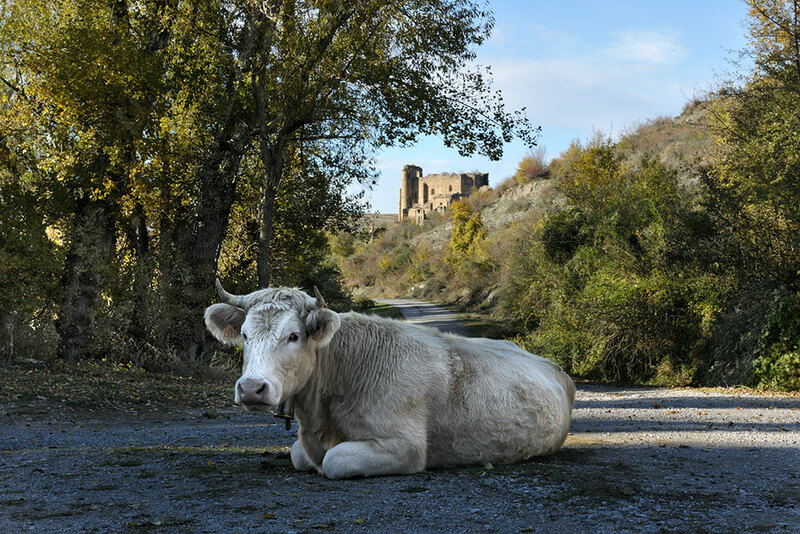 All along the Duero river, as we travel towards Burgos, stand former military strongholds, homes of legendary warriors, like El Cid or Khalif Almanzor, as well as religious retreats where monks found peace away from the troubled times. The following Guide/Road-book tries to combine all the informations you’ll need to venture safely and learn as much as you can about this fascinating land. Languages. Spanish and local regional dialects. That’s it ! Don’t expect to get by with english, Locals don’t speak it, and most, if not all, valuable touristic informations are only in Spanish and regional dialects. So bring your dictionary! Visas. Spain is part of the Shengen zone. All borders within that zone have been abolished. If you are from the Shengen zone, no visa is needed . If you are from outside European Shengen zone, you need to check with your local Spanish consulate and apply for a visit visa. It can take up to a month to get one, prepare your trip in advance. For more infos on visa rules click here. Your passport must be valid for the next 6 months after arrival. Driving license. All European driving Licenses are valid in Spain. If coming from a non European nation, have your international driving license with you. Money: The currency in Spain is the Euro, abbreviated EUR. To find out the exchange rate click here. 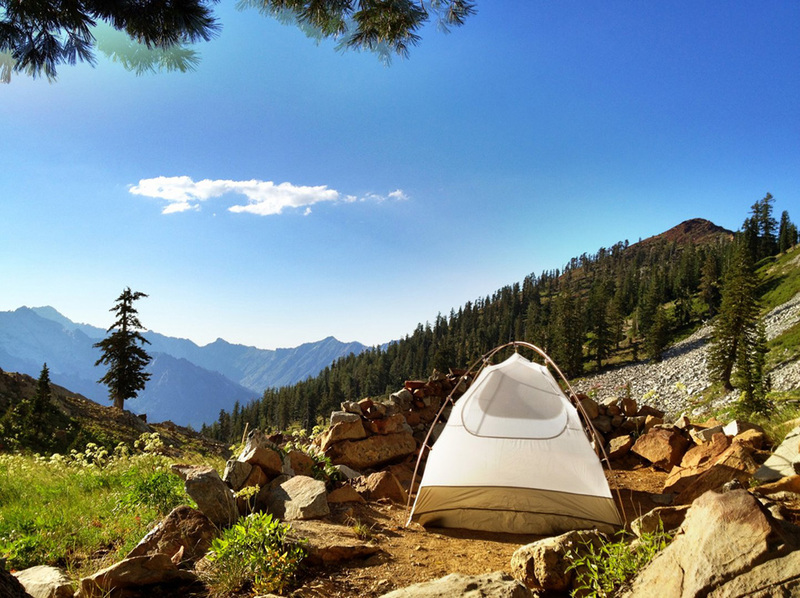 Lodging: 99% of the time you’ll be camping under the stars. Wild camping is legal in Spain. It is safe and you’ll find many beautiful sites to enjoy the nights. Now, you will most likely be on somebody’s property, without having asked for permission. So, be respectful of the place, don’t be loud and leave no trace. You also have hotel options along the way. As the trail is divided by day long sections, we have listed some available options for you in the following route breakdown. Some are very basic rural accommodations and we have not tested them all, as such we can’t review them fairly for you. Food: You’ll feel like being in the middle of nowhere, but in reality a town or village is never too far. Markets, bars, restaurants are many along the way for you to pause and refill. 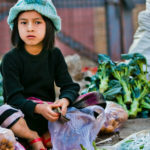 The local food is rural and simple, and meat is its main asset. If you’re Vegan, this isn’t the easiest place to eat out ! Again we did it during the fall. Thanks to climate change or just bad luck we had rain almost everyday and even a snow storm. However this is very unusual, the weather normally being much better that time of year. Check the forecast regularly on Spain weather. Phone coverage is pretty good all over. That being said, we strongly recommend you always carry a satellite phone. This trail combines GR paths, cycling routes, a good stretch of the TET – Trans Euro Trail, (an excellent set of trails done by and for motorcycle enthusiasts) – and seldom used scenic backroads. As such, it can be done anyway you choose, may it be on foot, horse, mountain bike, motorcycle, SUV or 4×4. We have done it with our beloved Jeep, but with the exception of one particular section, for which we offer a diversion, it ain’t a must like for example the Oman trail. As such the daily breakdown suits a motorized convoy. MTB will probably cover the same distances per day, as you never have the opportunity to put your foot on the gas ! In the end it all depends on your preferences, your motivations, your experience, and the physical condition you are in, the SUV/4×4 being the most comfortable choice. Whatever your mean of travel, you must clearly understand and be well prepared for the specifics your choice implies. No matter what you decide, and the advantages it may offer you, they all include risks you cannot ignore. There is no such thing as a 100% trouble free adventure, and that’s precisely what makes it an “adventure”. The best way to minimize those risks is to be well prepared. How ? Do everything possible to avoid trouble before hand, and be sufficiently self reliable to get yourself out of trouble if necessary. Finally, may you be a “through” traveler looking to complete the trail in its entirety in one journey, or explore a selected part at a time, or may you decide to follow the trail as described starting at the French border or do it in reverse, is all up to you. Physically: No matter how you want to complete this journey, you must be sufficiently fit to survive any potential physical activity performed in this environment. Do not under-estimate the risks, thinking all will be just fine because you might be sitting comfortably in the air-cooled interior of a car. There will be many occasions for you to expose yourself and it can be brutal if not acclimated and ready. If you choose to cycle or walk it through, know that it’s rarely flat – actually it’s never flat – so better be ready for the elevation ! Mentally: This trail offers challenges. 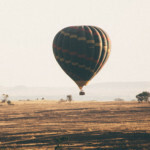 Even though it was never designed with adrenaline junkies in mind, it may put you under stress every once in a while, depending on your level of experience. Be ready to reach out of your comfort zone now and then. Know yourself, observe, take your time and trust your judgement. Know your way: Not every trail can be found on local maps (most are, but still). To safely navigate, you will need to download the routes and all other pertinent navigation points onto a GPS device. To do so will required the use of softwares like Google Earth or Gamin’s Basecamp, etc. However do not rely entirely on your GPS, study the trail on Google Earth as much as you can. You should almost have it memorized; its path, the points of interests, the gas stations and other food supplies stores, the escape routes, etc… Your first asset is your personal knowledge. It will be extremely precious when confronted with unexpected alterations and roadblocks, may they be the result of natural degradations or human “progress”. We will try to update this guide with the latest evolutions based on the feedback we get from fellow travelers and authorities, and offer alternate options, but there is always a risk to be confronted with the unexpected, and you should be able to “improvise” on your own. Be technically savvy: Make sure your vehicle is in good working order before leaving. If you use your own, have it checked by a professional mechanic, and perform all due required service. To keep it in good order during your trip, drive/ride it with caution at all times. Your car or bike breaking down on its own is very unlikely, the odds of you breaking it by reckless driving, are unfortunately much higher. In case something is to happen, you must know how to diagnose the problem, and have the parts and the skills to fix it on the spot. If you are renting your vehicle, make sure it is from a company you can trust and offers good assistance even if on a trail. A mini might be a daring choice but after all nothing is impossible. 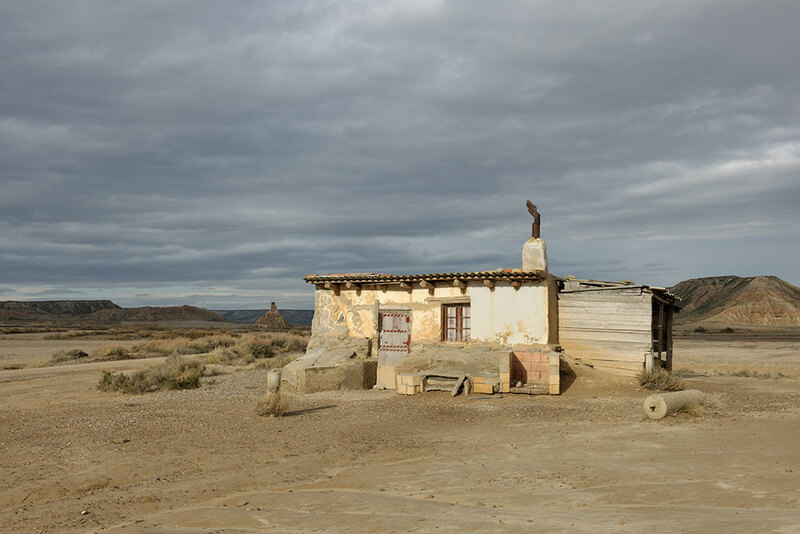 Look for that same house under a different light in the section six dedicated to the Bardenas Reales © The superlative adventure club. 4×4: A real 4×4 is always the better choice. It has the off-road capacity to take you everywhere safely on this trail, no matter how technical it may get. But in all fairness a good SUV with all-wheel drive will do fine. If you are renting a 4×4 or SUV ask for AT (All Terrain) tires with it and make sure it has a real spare. Enhancements: No modifications are necessary for this trip. We belong to a very small group, that believes a 4×4 is best kept in its original specifications. Driving a vehicle well thought of by experienced engineers and tested thoroughly by qualified technicians, sounds safer to me than an “artistically” modified “beast” assembled by a local backstreet garage. To each its own ! If you don’t have one, you need to rent one. However you must make sure that they will allow you to leave the tarmac. Not all do. Motorcycle / Quad: Again, a good portion of this trail was found on the TET. So it’s definitively Motorcycle friendly ! Remember, it’s not the size that matters, some complete the Dakar race on 125cc machines. It’s how you drive it and its fuel autonomy that matters . Listed on the following routes are all the fuel options along the way. Plan your fuel needs accordingly. 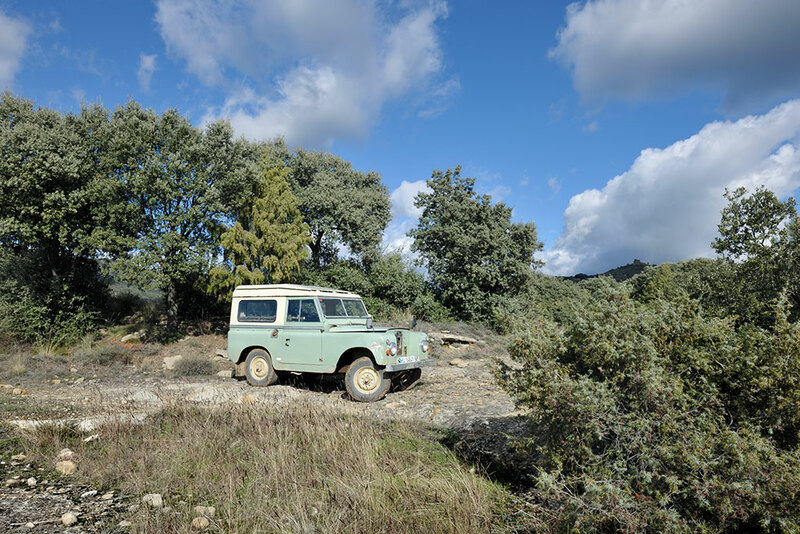 if you are not familiar with off-road driving we strongly suggest you spend time reading our beginners guide to off-road driving. However, If you have no experience and plan on doing this alone, you are looking for troubles. More on solo driving below. Basic rules: First and foremost you must follow and stay on the indicated or visible track. B – because the mountain terrain is way too hazardous to allow you some improvisation safely. A common mistake is to take a wrong path, and then decide to “cut through” to get back on the right one, instead of safely going backwards to the point where you took the wrong turn. What seemed like a short cut is 9 times out of ten a recipe for disaster. C – Do not enter a portion of the trail if you don’t feel capable of passing through. Turn around when you still can. There is no shame in knowing your limits. A u-turn under stress on a narrow track shouldering a cliff is not a fun nor safe experience, reversing is even worse. When in doubt, get out of your car and walk it first to make sure you know what you are getting yourself into. Then take your decision. There are many alternatives available for you on the trail. 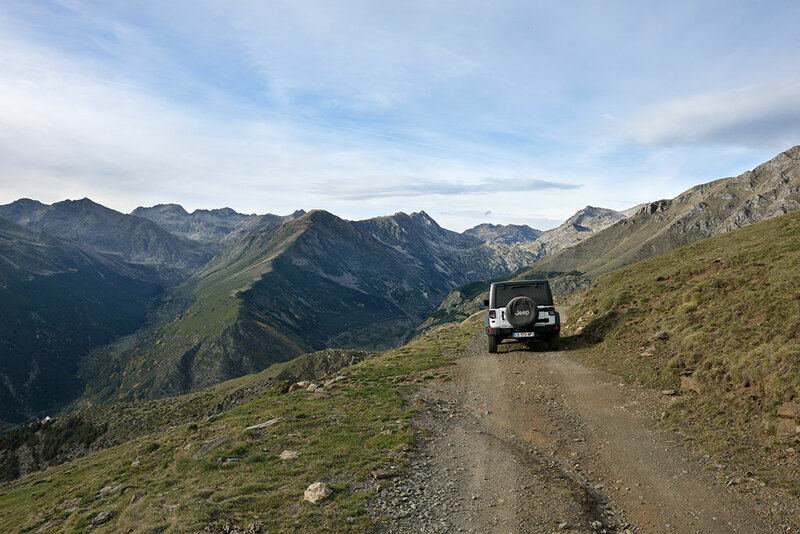 Most of the trails you will drive on are well maintained… That is until it rains. Rain running down mountain slopes will follow the easiest path available to reach the valley below. That path is your trail. In doing so, it turns it into mud, create trenches, gulleys and displace rocks of all sizes. It may even take down entire stretches of the trail if passing through it perpendicularly. For some, it is when the real fun begins, for others this is when unwanted complications take the fun out of the trip. Mud: If traveling like us during the fall, chances are it will rain and mud will be become your main distraction. Some love getting their car dirty, we don’t ! Now don’t worry, it’s never that bad and in the end it’s all a matter of good traction, the right gear and momentum. When confronted with mud, stop, assess the obstacle, deflate your tires for increase traction if you deem helpful, select the right gear combination and enter. Do not engage too fast by fear of getting stuck in the middle, chances are you will slide, spin your wheels and get stuck or worse hit too hard an obstacle you couldn’t see at first underneath and break something. If stuck in mud. Either get towed out if you are in a group, or get your Maxtraxx or winch or a shovel if you are alone. If you have nothing like that with you, (then you are ill prepared !) pile rocks you can find around you underneath your tires to get better traction. Driving at night: Besides the obvious safety issues, what is the point ? You are on this trail to admire the landscape. The main reason why you might be tempted to drive at night is most likely to be because you want to reach a pre-determined campsite and you’re late. Don’t ! In case you realize you are not going to make it on time, look around you and find a suitable space while it is still daytime. There are plenty along the way. Solo or in a group ? This trail can be done solo just fine. Again with the exception of one technical downhill section in Aragon, it’s remains very safe. However, if you decide to do this as a group, know that you can’t travel through certain areas with more than 5 cars. Now, a group is almost always a safer way to enjoy this or any other adventurous endeavor. But it requires more organization and more discipline than going away on your own. When planning a group “expedition”, there is a lot more at stake than group chemistry. Being good friends is great, but it is not enough. Everybody must bring something to the team. Being responsible and in charge of a needed skill. May it be driving, navigation, mechanic, cooking, language, etc… A group of 10 drivers where nobody knows how to fix a flat tire, understands a map, doesn’t speak a word of the local language or ever started a fire, is not a team but a moving traffic jam looking for trouble. A team needs a leader, a person with authority that can open the road and guide others according to everyone’s potential. It takes a lot of experience and psychology to be a leader. It also needs a second “in command” sweeping at the back of the convoy, helping those in trouble. Communication among all team members is key. Make sure you build a qualified team around you and try it on a few short outings before making the big jump. On the other hand, solo driving offers more freedom and flexibility but requires a certain amount of experience in many domains as you will have to solve every challenge that comes your way on your own. Now, if you are coming to the region for the first time, are on your own to do this trip, have no experience with off-road driving in this environment, speak no Spanish, it goes without saying that renting a car to tackle this trail alone is asking for trouble, and we can’t be held responsible for all the pain you might get yourself into. You’ve been warned ! Fuel: There are many gas stations along the way, all indicated by gps points. As such gas was never an issue. As a general rule we always carry an extra 20L Jerrycan of fuel in case of an emergency. We also refuel whenever we can regardless of how much gas we have left. Always play it safe. Know your car’s/bike’s range and average fuel consumption based on encountered terrains to avoid surprises. Look at the distance between each gas station on google earth, check the opening hours of the various stations and if they carry your specified requirements. We have listed them in our daily route breakdown in the attached files. There is also a substantial consumption difference between driving in 2WD or 4WD mode. Stay in 2WD as much as you can will save you a lot of gas. Equipment: Less is more. Why ? Because weight is your enemy. We live in a society that thrives on consumption, where marketing gurus will have you feel naked unless you possess everything for anything. Through ads, brochures and reviews, they will lead you to believe that you can’t do in life without the latest, the most, the best, the highest, the biggest and the useless. We, too, at first, felt for it, thinking we needed to look like “explorers” to explore, convinced our safety, our comfort, worst, our credibility depended on it. 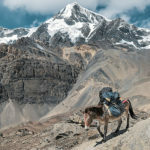 And while most of the inhabitants you will meet while exploring remote areas, thrive with close to nothing, we feel obligated to carry the world with us to just survive. It not only has a cost, it also has consequences. The heavier you are, the harder it gets to move it. It’s called weight versus performance. Or how a simple climb can quickly become an Everest because you took too much useless stuff with you. Here is a list of what I bring with me. A flat surface where nothing is altered to set-up your tent, good protection from the elements, amazing view… The perfect campsite ! Try to set up camp an hour before sunset. Finding the location, unpacking, getting your tent up in the dark is not as nice, worse can lead to unpleasant surprises. Last, due to the constant threat of wild fires, fires are not allowed while camping. We shouldn’t have to say this, and it should be obvious to anyone. Unfortunately it isn’t. Do not leave anything behind. No one is here to clean up after you !! We have listed what we know, feel free to improvise if you find a spot you like. In some areas, due to the terrain, your options are minimal, in others, there was just too many possibilities to bother listing them. As it should be obvious, just respect your environment and the people around you. Because there is a lot more to do than just drive. The mountains offer great outdoor opportunities, – like the exploration of the Aigüestortes National park or the canyons of the Sierra y Cañones de Guara – Plan extra days to explore them and bring along with you the required equipment to explore the surrounding wonders. If interested in trekking or canyoning; check with local guides what your options are. Always be safe ! This guide won’t get into the specifics of each activity and the skills and tools you need for it. It is understood that if you decide to explore out, you have the experience and ability to do it. There are no appetizers here, no “Mise en bouche”, as we jump straight to stunning ! Crossing over the Catalunya Alt Pireneu, and its Vall d’Aran. 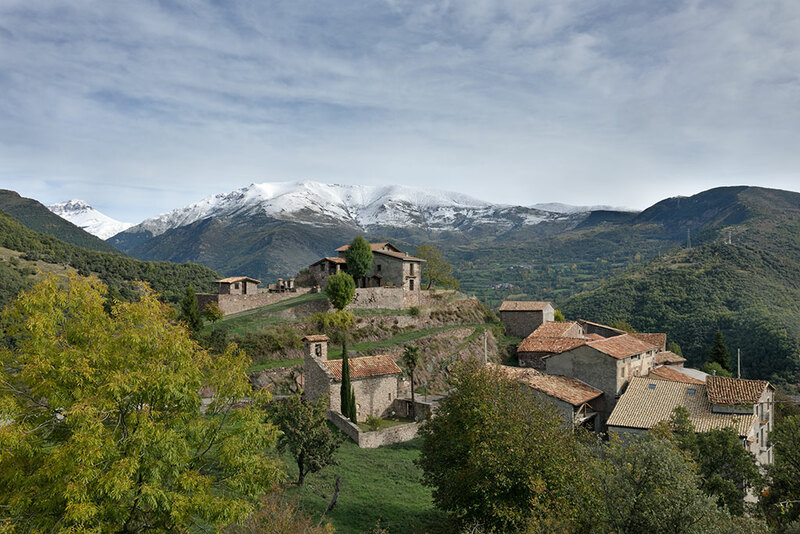 The Aran valley is an autonomous region (as opposed to just a single valley) within Catalunya, ruled mainly by the local Aranese institutions, which have declared Occitan its official language, while the local Aranese dialect is still taught at school. Today’s main economic sector of the valley is tourism, rapidly replacing the agro-pastoral activities of the past, when the “valley” was living pretty isolated from the rest of the world, particularly during winter, when no connections with the other southern valleys were possible. The trail will start on the banks of the Garona river, (originating nearby on the Beret flat), flowing rapidly on its way to France and the Atlantic Ocean. From there, we climb up on our way to the Vall del Varrados, Vall del Noguéra Palharesa, the Marimañha Natural Reserve, all the way to the gates of the Aigüestortes National Park. High snow covered peaks… Wild streams and cascades running down pristine valleys… Forests dressed in crimson, red, orange and gold… Isolated villages and secluded monasteries… Abundant wild life for whom knows where to look… Today is a journey filled with eye catching splendor ! To simplify, I could say “everything”, as the views never stop on giving. The valley is home to the Varrados or Barrados river running down the mountain on its way to the merge with the Garona. At its bottom, beech and oak trees, turn the valley in a beautiful array of fall colors, before merging with higher pine forests. 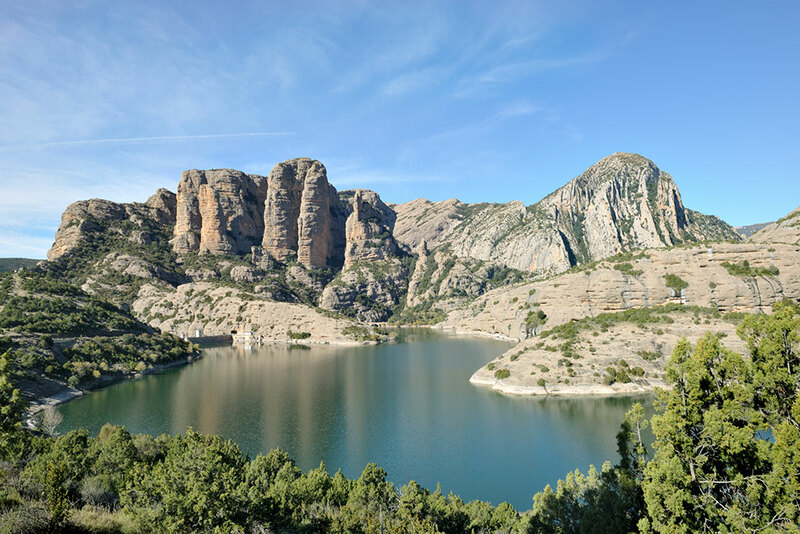 Make sure to stop for the Ermita de Sant Joan d’Arros, the Saut deth Pish cascade, and the Varrados Pass, all located right on the trail and marked on the attached Google Earth file. Again, stunning valley carved by a river, the Noguéra Palharesa, originating just a few meters away from the Garona but going in the opposite direction towards the Mediterranean. 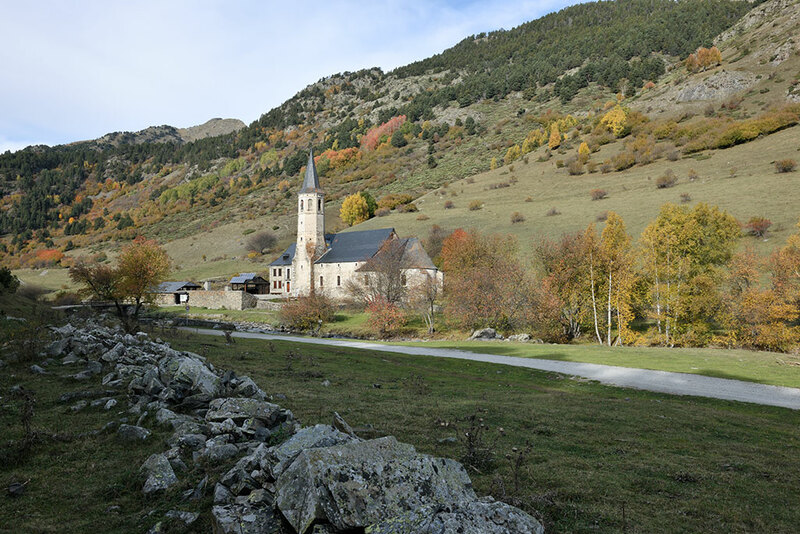 The valley is known for the Montgarri monastery, as well as the presence of the recently reintroduced brown bears (to the shepherds displeasure). Historically, it is also known as a former escape route for persecuted jews during world war two. Many signs found in the valley remind us of their story, as well as some of the marked trails you can follow for an on foot deeper exploration. 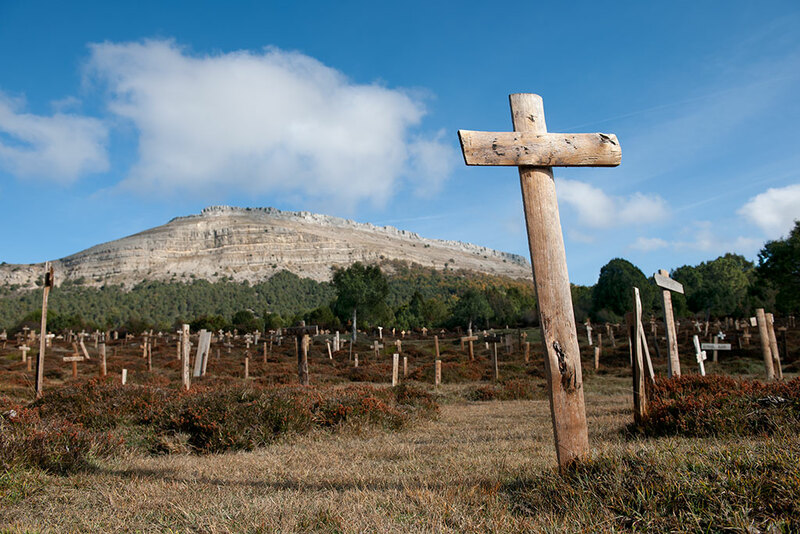 Unfortunately, you’ll notice that many religious monuments in Spain are closed to the public. Only allowing you to admire them from the outside. It’s unfortunate. However, we will mention it when you can book a visit. “The park is one of the fourteen Spanish national parks, and the only one located in Catalonia. 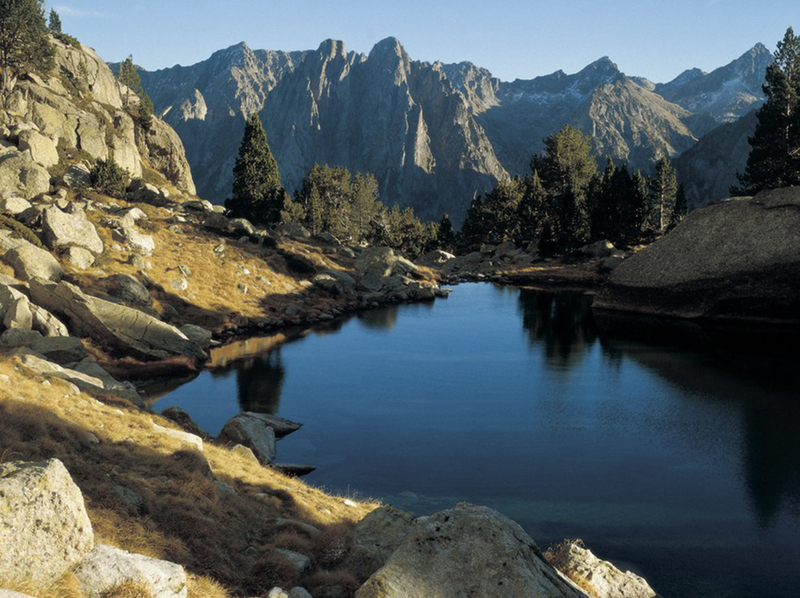 A wild mountain region in the Pyrenees, with peaks rising to 3017 m (Besiberri Sud) and with nearly 200 lakes, many of them of glacial origin, the park comprises a core area of 141 km2 and a buffer zone of 267 km2 surrounding the park. The park’s name in Catalan is Aigüestortes i Estany de Sant Maurici, freely translated as “The winding streams and St. Maurice lake”. The park has an elevation range of 1600 to 3000 meters and contains four major vegetation zones: lower montane, upper montane, subalpine and alpine. It goes without saying that we strongly recommend you spend the following day on site and embark on one of the designated treks. For all necessary informations on your options please visit the Park website. The drive may seem impressive at first because of the elevation, but there are no real challenges along the way. Just take your time as it can get a bit bumpy thanks to the rocky nature of the tracks. 2 wheel drive is fine all along. Make sure to fill up in Bossost before leaving in the morning, you may want to deflate your tires to 25 psi for more comfort as well. The overall distance is not very long so you can stop often and enjoy the beauty around you. Just make sure to leave as early as you can as the days during the fall are pretty short: 8 am to 5pm. Because it is recommended to start the trail at dawn, you need to spend the previous night in Bossost in one of the local hotels. At the end of the section the town of Espot offers several hotels for you to choose from, like the Roca blanca. If you do this trip during the fall, it will be deserted. During summer, it will be full ! The village of Castell-Estao overlooking the pics of the Aigüestortes National Park. Today we’ll be driving around the Aigüestortes National park south side, in what is called its ” buffer zone”, before plunging down the Vall Fosca and its pretty villages perched on rocky outposts, crossing over to Vall Ancs, before reuniting with Arriù de Noguéra Palharesa at the Collegats Gorges, and finally touring the Boumort Forest filled with wildlife, before a night on the Talarn lake. 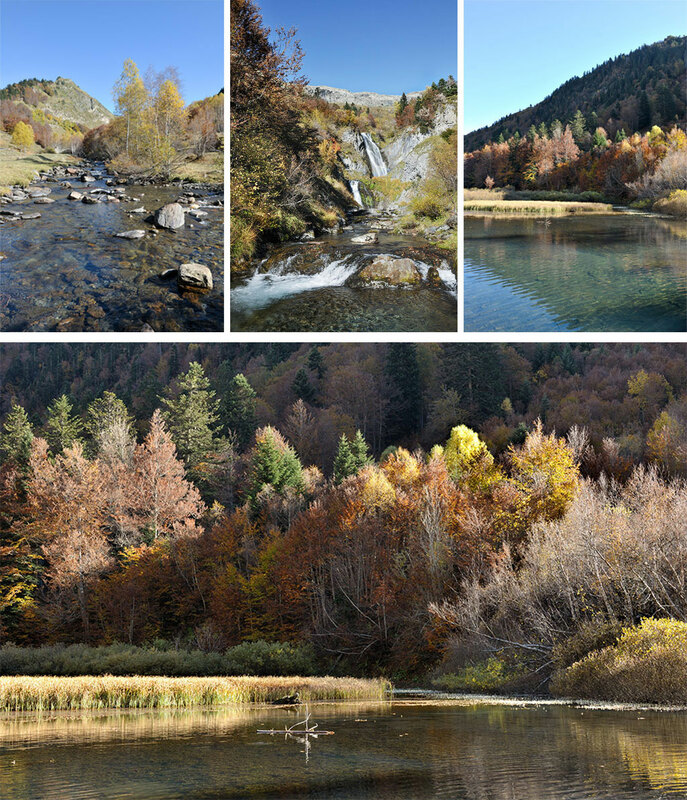 Today is a display of varied mountainous landscapes showing the natural and cultural diversity the region has to offer. If you didn’t take an extra day to explore the park as advised, you have a second chance along this trail, as it passes by the south side of the park. At 42°30’22.07″N – 1° 3’10.28″E you can park your car and climb up for a better view. Depending on how far up you decide to go, you might have to adjust the rest of your day. You might even decide to camp here. Driving around the Aigüestortes park. 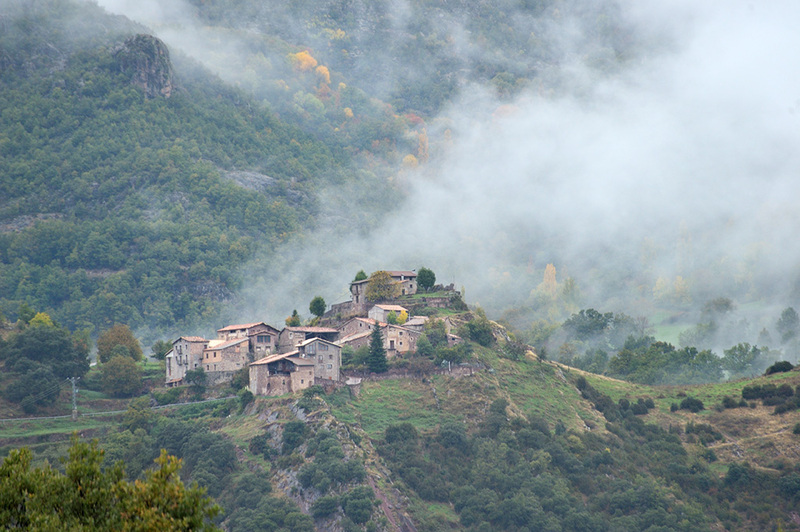 The village of Castell-Estao in the rolling clouds. Vall Fosca means the dark valley. The name is the result of the sun disappearing early behind the surrounding mountains. However, the irony lies in the fact this valley was the first part of Spain to generate and receive electricity back in 1914, making it de facto the brightest place around ! The main attractions, besides the old electrical plant, and the cable car leading up to another entrance of the Aigüestortes Park, are the traditional villages looking over Arriù Flamisell. 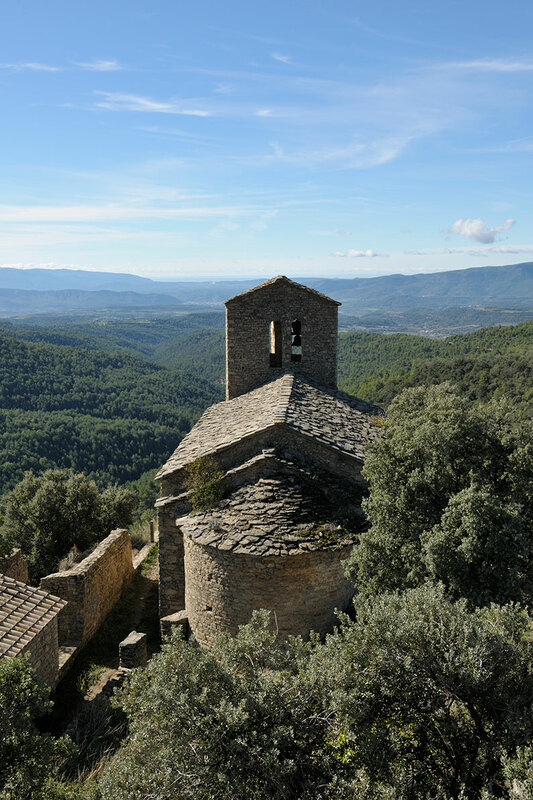 Castell-Estao, Pobella, are perfect examples of the local rural architecture of the Pallars de Jussia region we are now in. Serrat de les Marrades leading to Vall Ancs. Its fog rolling through the valley where beech trees turn bright yellow in this late October. This is our first encounter with this red colored earth that translates to the surrounding stones. During the fall it complements perfectly the yellows of the Beech leaves, making it all picture perfect. The fog rolling over the hills emphasizes the fall mood even better. The isolated villages at the bottom of Vall Ancs, some only reachable with the proper set of wheels ! The Collegats Gorges, carved by Arriù Noguéra Palharesa. This is probably the most stunning part of this section, where the Noguéra river has carved its way through the Queralts rocks, creating the Collegats Gorges, a very deep and narrow canyon you can only explore on foot or kayak. The main attraction inside the gorges is the “Roca de l’Argenteria”, where water pierces through the limestone rocks, and is said to have inspired the architect Gaudi for one of his creations. To explore on foot, park in the designated parking and walk along the canyon, before returning to your car. To enjoy the river’s other activities, like the Via ferrata, canyoning or rafting, please contact La Puebla de Segur tourist information center to find out about one of their local guides. The Queralts rocks with the Aigüestortes park in the background. I wish I knew the name of this stunning rock formation on the other side of the Queralts, overlooking La Puebla de Segur. The sun ws kind enough to shine for a few minutes, allowing me to see it under a more pleasing light, before climbing up the Sierra de Boumort and its snow covered tracks. The Boumort Forest is a national hunting reserve. As such you’ll be able to see boars, deers, elks, wild rabbits, foxes, etc… We passed through snow but this was highly unusual at that time of year and shouldn’t be the case when you pass yourself. 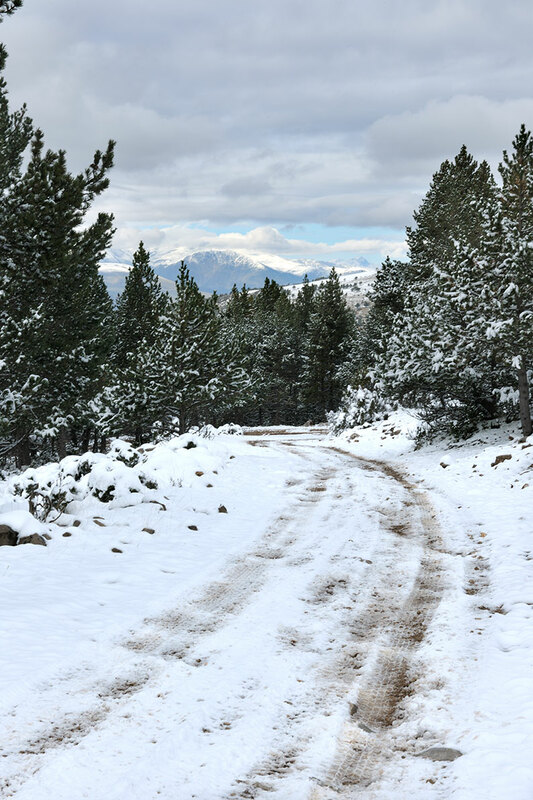 The trails in the Sierra de Boumort covered with snow. Some areas are closed to the public and you need to stay on our trace or the designated paths. Now, visits can be scheduled under the guidance of local authorities. Consider that a full visit will take most of your day. Again check out the dedicated PDF’s on the La Puebla de Segur website. Today is an easy drive. 2wheel drive all the way unless it gets muddy. Keep your tire pressure at 25 psi for traction and comfort. You can refill at La Puebla de Segur. Three options are laid out on the attached files for you, depending on how much time you spend exploring on foot throughout the day. If all goes according to plan, you will camp by the shore of the Talarn lake between the towns of La Puebla de Segur and Tremp. If you can’t make it there on time, you have a nice option inside the Boumort forest. Check the Google earth attached file for exact locations. The forests of Aragon below the high peaks of the Pyrenees – And yes that house all alone in the woods would suits us perfectly ! 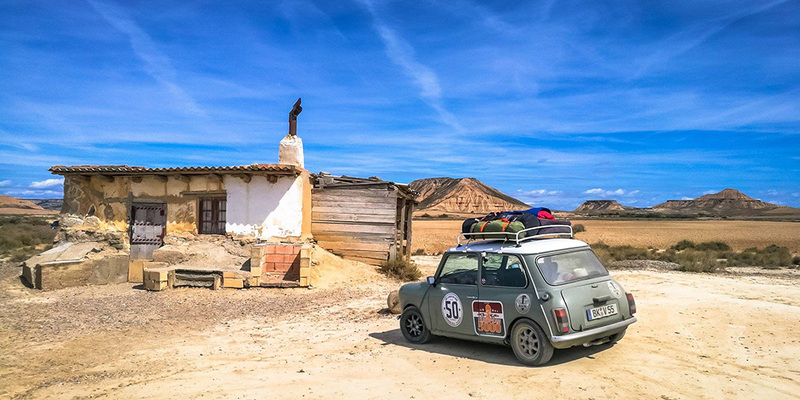 Today we leave behind Catalonia to enter the Aragon Province, in what would have been one of the easiest drive of the trip, if it wasn’t for one downhill that will bring back the joy of real off-road driving some of you crave. Now, no worries, we have created a diversion for those not interested in testing their cars and skills. The first part of the trip from Tremp to the border with Aragon cuts through the Vulture valley. More isolated villages, some abandoned, vast wooden areas on the lower hills of Aragon, making today a transition of sort between the higher mountains of Catalonia and the Sierra y cañones de Guara Natural Park. Enjoy the drive, vultures might be your sole company. 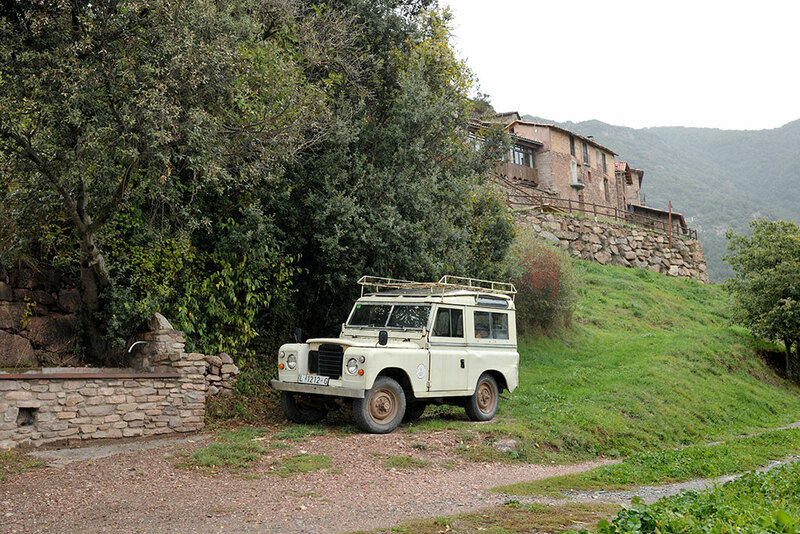 Ruined villages in Spain are beautiful, and there are plenty to see along the way. Let’s be fair, vultures are to Spain what pigeons are to Venice. You feel like the luckiest person in the world when you get to see your first one up and close. But the great thing is that vultures are all over the place and spotting them is very common, in vulture valley and pretty much everywhere else. The glacier circus known as Vulture valley, right on the edge between Catalunya and Aragon. Another beautiful isolated ruin, standing lost in the middle of the woods, offering a nice view of the surrounding Aragon forests. La Puebla de Fantova was one of the many fortified outpost erected in the region to defend the local population from the Muslim Vanguards. Today’s drive has one difficulty; a rugged downhill after Abenozas leading to Santa Liestra y San Quilez. All the rest is easy. The track there has been ruined by rain water. It is rocky, has wide and deep ravines, and large obstacles such as large fallen branches and loose rocks. It is also subject to heavy mud. This doesn’t make it the Rubicon, but it is a real (fun) off-road section. You’ll need a real 4×4 with high clearance and a Low Ratio gearbox. If riding a bike it’s all good, but for a car it is a challenge. It may be in much better condition when you pass, or far worst, it all depends on the weather. Just get out of your car and check it out before you enter, and consider the proposed diversion if you don’t feel like going through. Four options are laid out for you, two campsites and two hotels. The first campsite is in the middle of the rough downhill. You have fields around a ruin that offer a nice place to stay. Now the fields belong to someone and may be in “culture” when you arrive. 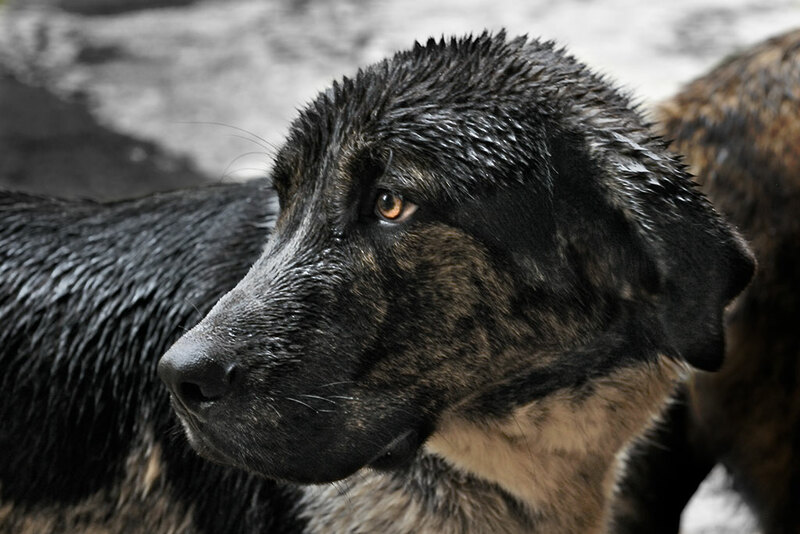 If the previous days have been rainy, like the heavy rain we encountered, it will be very muddy. That also goes for the second selection on the other side of the valley. Personally we opted for the Lleida Hotel in Graus. A hotel after all those days in the mud sounded like a great idea. It’s very basic, but diner was good and the staff very friendly. or for something more upscale the Palacio de Obispo. 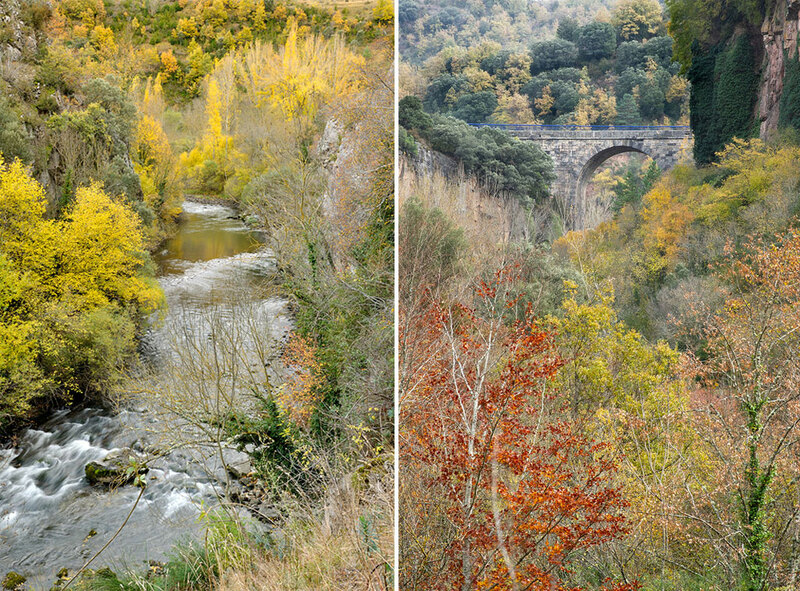 From Besians – to Sierra y Cañones de Guara Natural Park. The Sierra y Cañones de Guara Natural Park is our attraction of the day. And what a place !! To find out more about the park follow this link. We focused on the main sites on this trail, but feel free to expand your visit if you have the time. Today we get cultural with the visit of Alquézar, before rising the adventure level with some canyoning in Rio Vero. enjoy ! Before describing Alquézar to you, let us first warn you about its popularity. In other words don’t go during the week-end, particularly during the all saints week-end like we did. No parking and flock of tourists can be a shock after a few days alone in the wilderness. That being said, Alquézar is a splendid destination, standing proud on one of the limestone outcrops overlooking Rio Vero. Alquézar is from the Arabic name “القصر” “al qaçr” meaning castle. Now, there isn’t a castle anymore to visit, but the Collegiate church of Santa Maria dating back to 1099 will compensate that technical point. Have a visit of the Casa Fabian museum or enjoy a walk through the surrounding streets. One of our favorite spot on this trip. The least you can do is park your car and have a walk down the canyon. 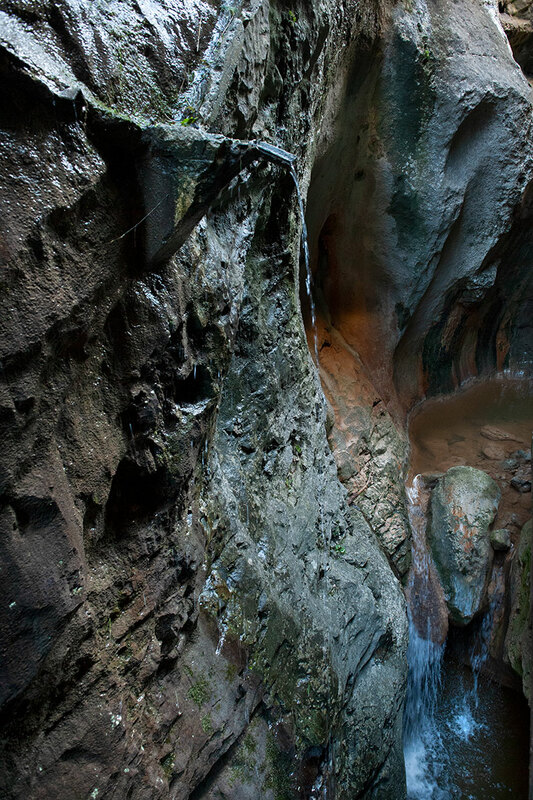 The best you can do is spend the entire afternoon canyoning around the caves of Rio Vero, either on your own if you have the experience, or under the guidance of a local professional. If you do spend the afternoon in the canyon, you will sleep on site, or in one of the surrounding campings. We have not used a local guide, but here is one recommendation we can pass on to you. No difficulties today, as most of the drive is on backroads. A diversion is drawn to go to Alquézar and back. So bring your tires back to their regular pressure. Depending on what you decide to do in the Natural Park, you might want to spend the night right by the canyon, either on the parking which has a very nice view, or one of the local campings. If you don’t spend that much time in the canyon, and follow through with your day, our last campsite is by a very isolated ruin. The access to that ruin is be a bit rough, because not used often, but the place is well worth it. 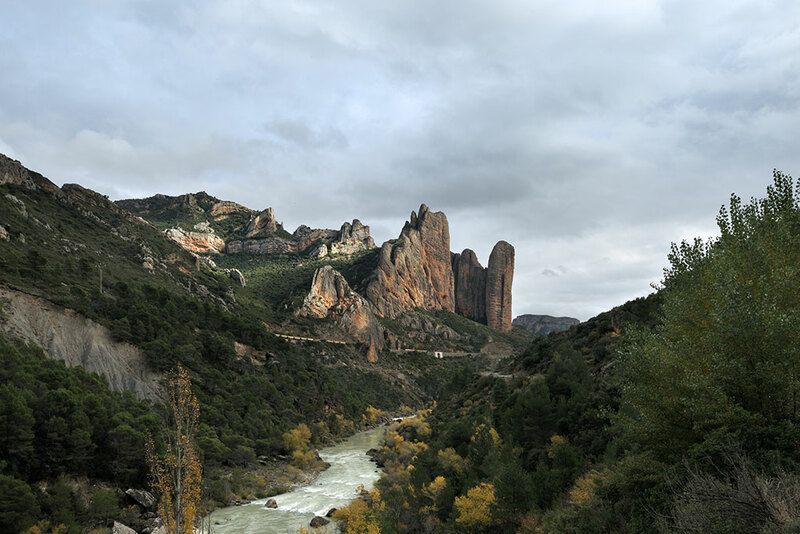 From Sierra y Cañones de Guara Natural Park – to Los Mallos de Riglos. 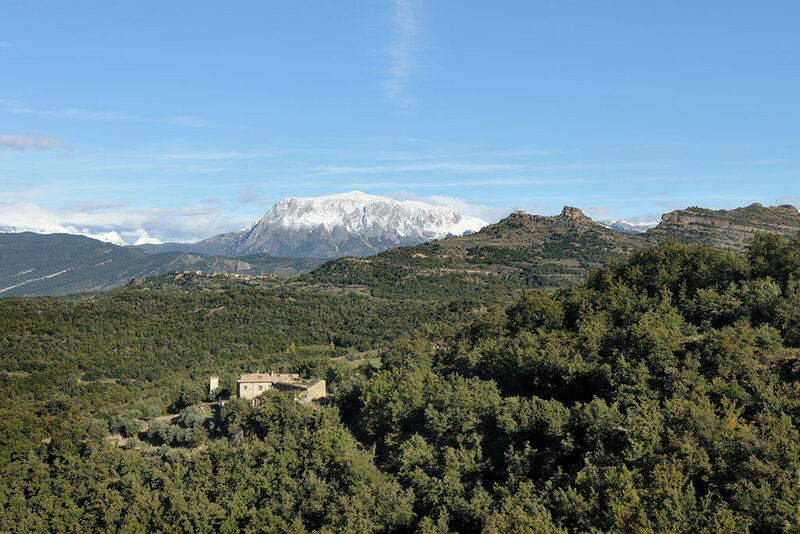 We just can’t get enough of La Sierra y Cañones de Guara Natural Park and are going, thanks to a new diversion, to have another look at it, before heading to one of the most famous landmark of Aragon, Los Mallos de Riglos. Entering the park from its south-West entrance this time to go look at Los Mallos de Ligüeri, where you can again have a nice walk around. Go there as early as possible for a chance at finding a spot on the tiny parking at the end of the road. Looking up from the town of La Peña you will wonder where in the world the trail can pass through this rock formation. Because until you actually pass through, it seems very improbable someone would have dared use this hole in the rock formation as a potential passage. That bridge with no ledge is narrow and only one car can pass at a time, but what a place. What awaits you at the top of the track once you are through is just as fantastic ! Would have loved to show you a decent picture of it, but the weather was just not on our side. Rio Gallego an hour before while it was still sunny is all we have instead, but trust us it’s stunning !! 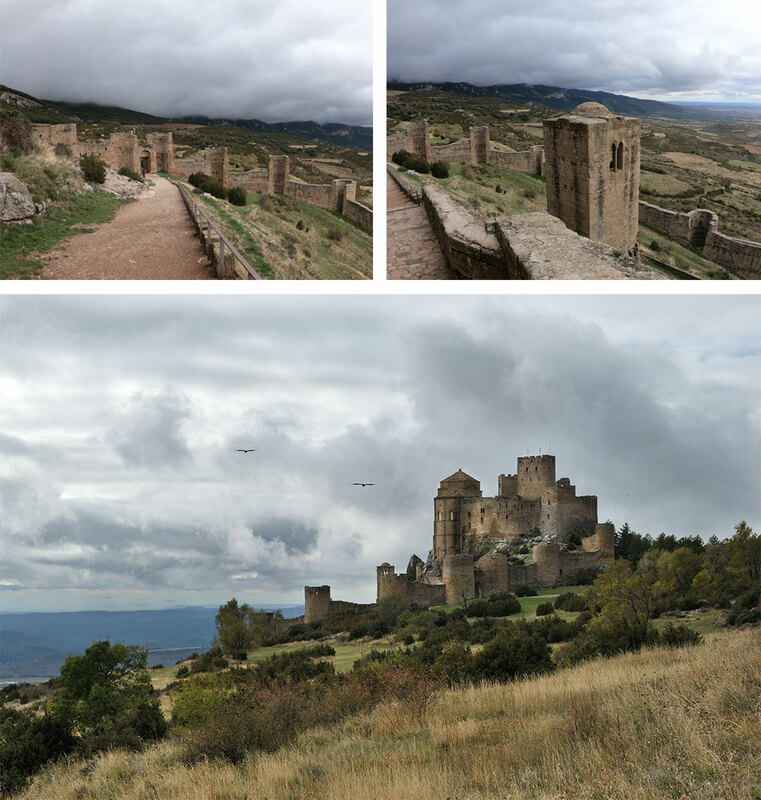 We put this landmark before the Loarre castle because, even though it is meant to be the end of this section, you will have a fantastic view (if the sky is clear!) of it, once arriving at the top of the climb from the Foz de Escalette. 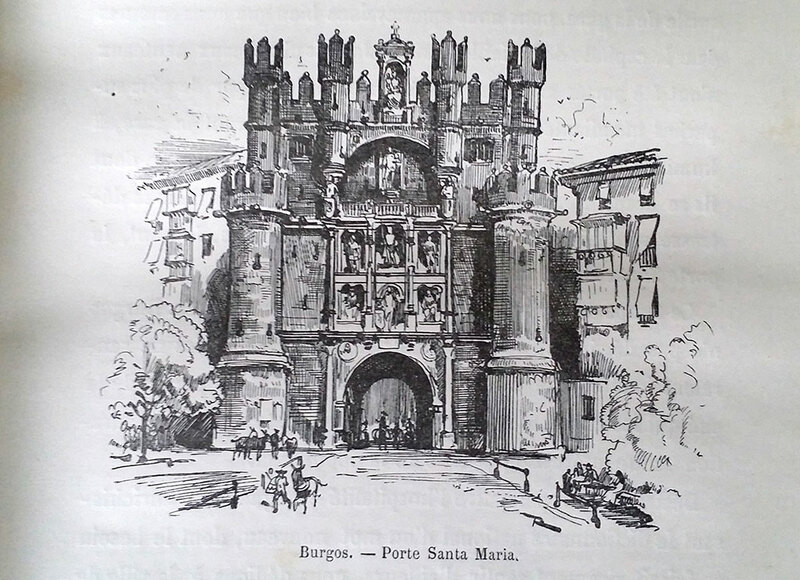 They are commonly called the gate of the Pyrenees, located in an area we like to call the kingdom of the Mallos, marking the transition between the high peaks of the Pyrenees and the Ebro valley. The most famous of those Mallos are the ones above Riglos. Those vertical rosset rocks rose up overtime when limestone cemented together many of the rocks brought down the surrounding mountains by what was once a large and powerful ancestor of today’s rio Gallego. The accumulation of those sediments, mixed with the mud giving it its particular red coloration, formed the massive rock formation, today severely eroded. A phenomenon repeated numerous time around the local rivers of the region. They’re also home to one of the most important colony of griffon vultures in Europe, as well as Red kits, eagles or Egyptian vultures. 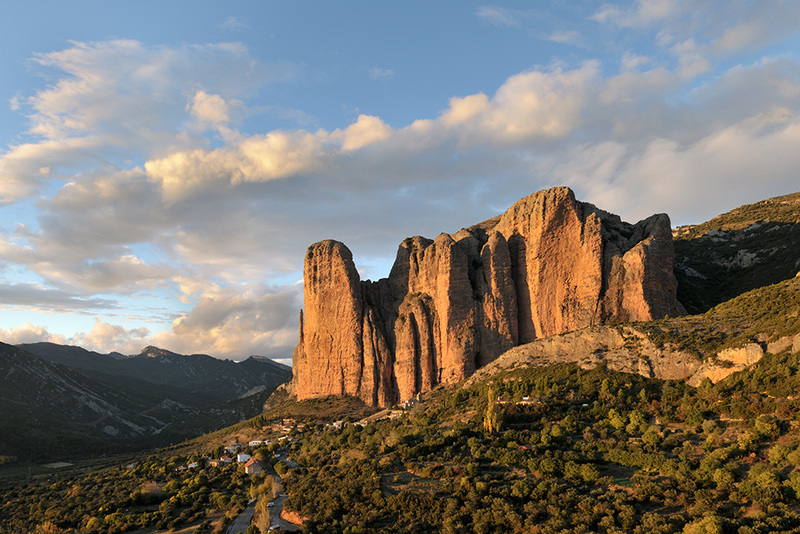 Today, those vertical monuments attract climbers from all over the world, and you’ll be able to see an impressive via ferrata starting from right above the church of Riglos, if interested in these types of extreme adventures. 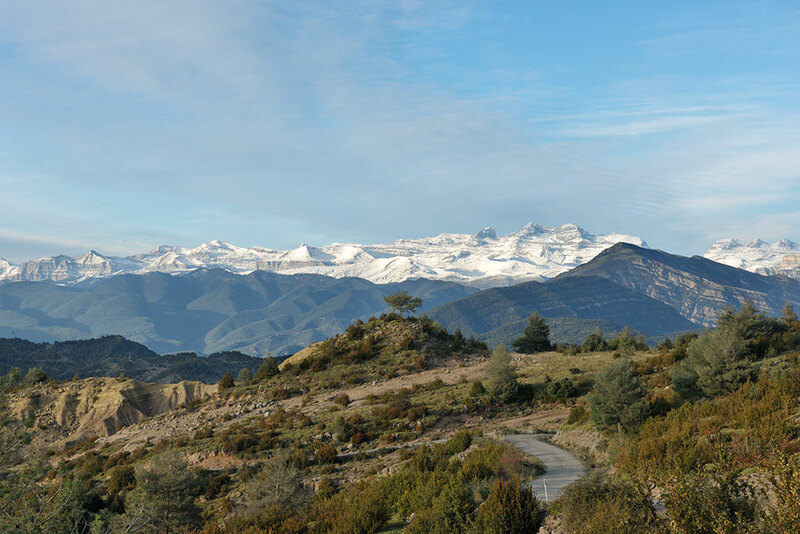 To find out about all the available trails, go to the tourist information centre in Ayerbe or have a look at the tourist website of la Hoya de Huesca. Located on the drive down towards Los Mallos de Riglos, the castle and the church in the village below are must see places. “A Cultural Heritage Site and National Monument since 1906, It was built in the 11th century. It is the most outstanding example of peninsular fortifications and the romanesque building that has survived to date is in superb conditon. It represents one of the best examples of military and civil architecture in Europe. 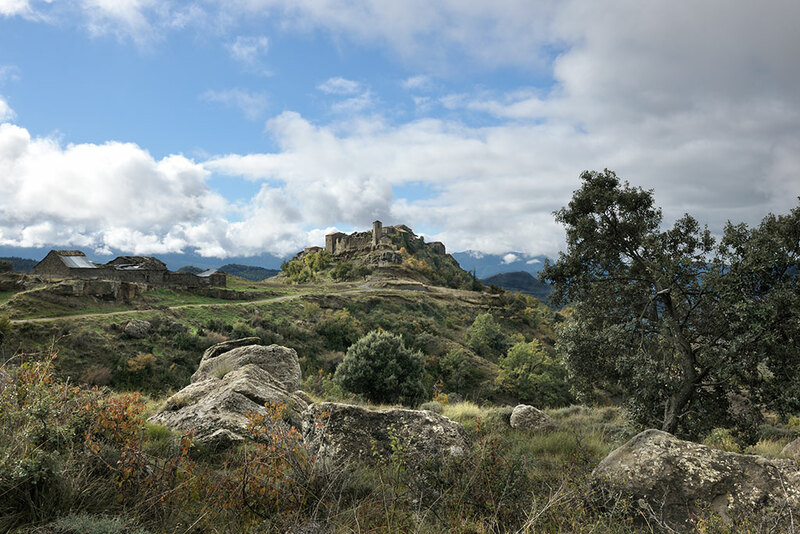 The discovery of Roman and Iberian coins in the vicinity of the castle has led to the belief that the castle was built on top of the ruins of the Roman site of Calagurris Fibulariensis. King Sancho III el Mayor de Navarra decided to build the castle in 1020, annexing it to his kingdom and turning it into a bastion of his defence against the muslim powers. It is not until the reign of Sancho Ramirez, around the year 1071, that fortification work is begun, along with its current configuration, and a religious component is added, with the foundation of the monastery for the Augustinian friars. Upon the death of Sancho Ramirez, his son Pedro I builds Montearagon, the principal house of the order of St Augustine, thereby relieving Loarre of its monastic purpose, whereas the subsequent loss of its use as a line of defense would follow on as a result of such monarch advancing in his conquest of the region, with the castle reverting to the crown of Aragon, which hands it over to lieutenants and officers of senior rank. The castle is now bare, and, if not all, some of its collections (Painting and sculptures) can be found in the church. The ticket you will purchase at the castle is also good for the visit of the church. For all pertinent informations click here. Open all year 7/7 except on Christmas and new Year. Ticket prices my vary, check the castle website for rates. After a short drive on dirt from the get go, you’ll spend most of your time on old tarmac roads until la Peña. Then the real fun begins as you start the climb through la Foz de Escalette and circle around the Mallos de Riglos formation. Nothing complicated at all, but incredible views. A peaceful transition from Los Mallos de Riglos in Aragon, to the Bardenas Reales desert in Navarra. The true attraction of the day being the Bardenas Reales desert. The Bardenas Bianca contrasting with the dark skies above. 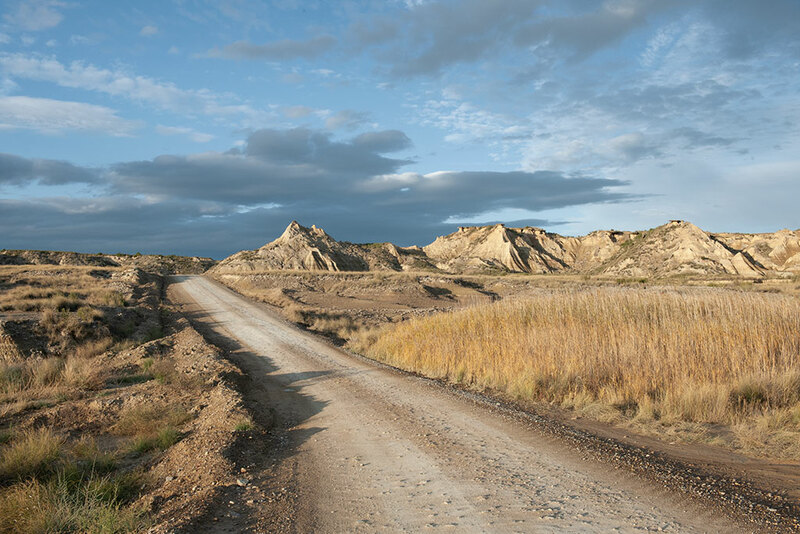 Also referred to as the desert of Europe or the Spanish badlands, this former lake dried up when its waters carved its escape through the surrounding clay and sandstones, to reach out the Ebro valley located on the other side. The wind continued the carving and erosion of the rocks creating the amazing site we see today. 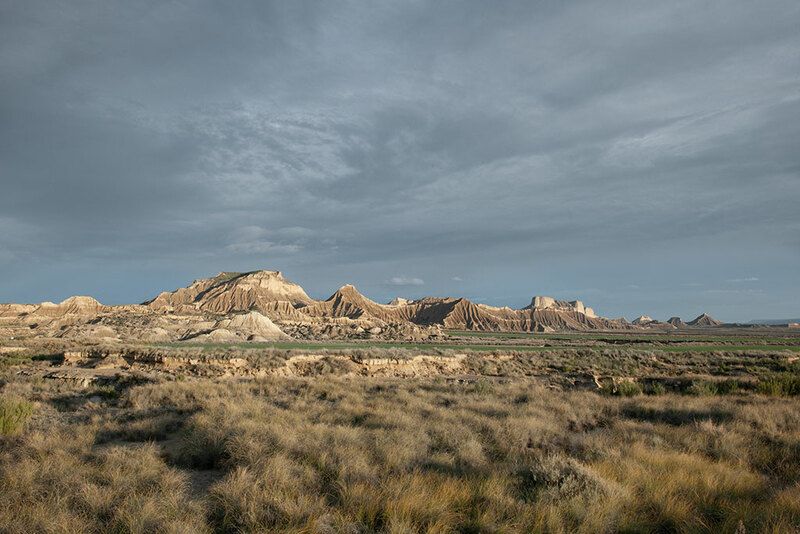 The Bardenas Reales is made up of vast and complex natural spaces in which different habitats and biotypes are present, some of them of exceptional value. The Bardenas are divided into three specific areas. The White Bardena, The Black Bardena and the Central Plateau, the white Bardena being the most popular, or touristic, part. You can drive around it, following the trail, but you should also explore on foot some of the canyons, and rocks. For more informations on the park, check out their website. 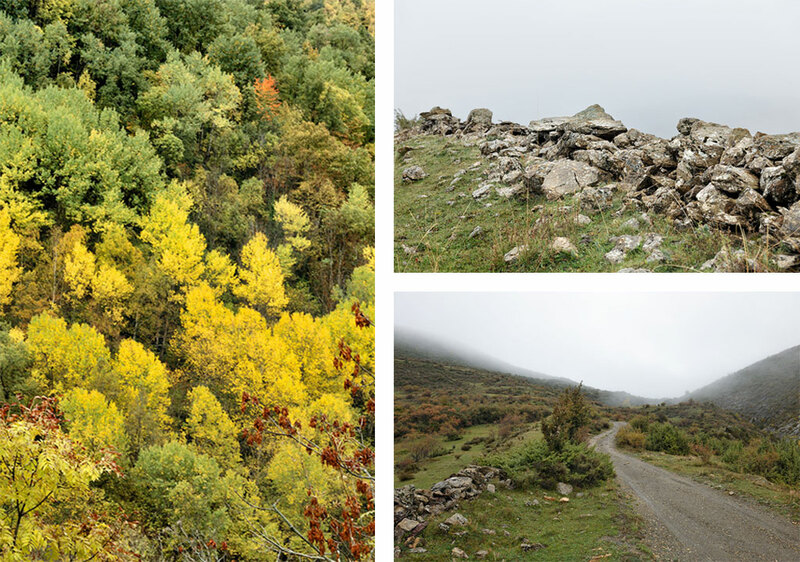 Forest hill tracks taking you from the gate of the Pyrenees to the Bardenas on the edge of the Ebro valley. No particular difficulties today. Two choices for you. Overnight camping in the park is not allowed, yet we have seen campers, so your call and if you do better be discreet. The other solution is to enjoy a night at the very cool and trendy (by far the best hotel of the trip but pricy) Bardenas hotel on the edge of the park. Complete change of scenery having crossed the Ebro river and entering the Sistema Iberico in La Rioja. La Rioja is the smallest autonomous region of Spain. It is very rural and sparsely populated, hence its charm. 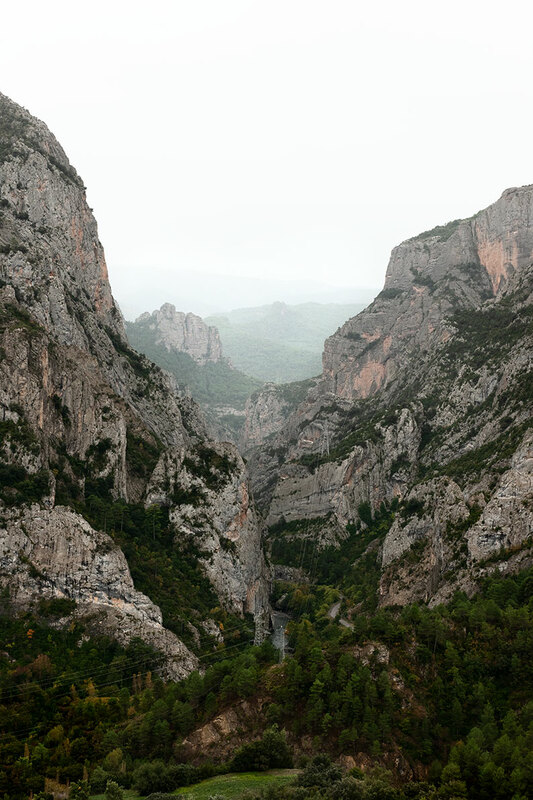 Also referred to as the seven valleys, as torrents, running down from its mountains on their way to the Ebro river, have carved striking depressions, canyons and gorges. 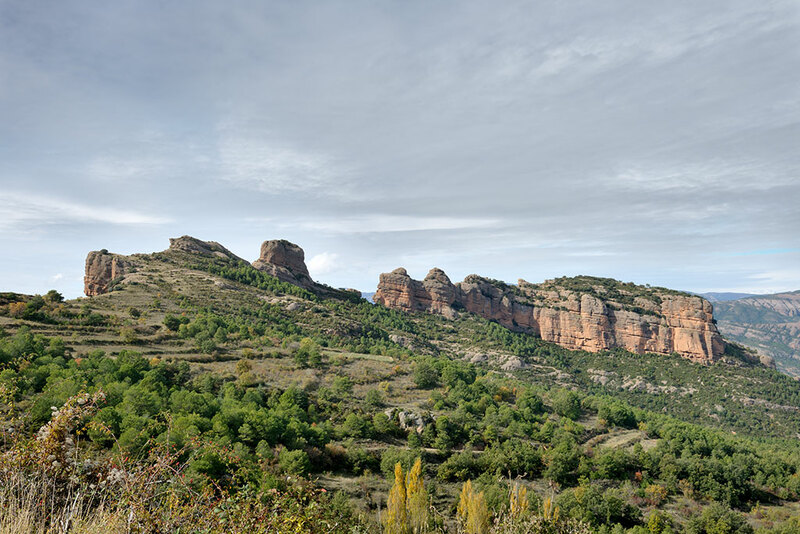 Mainly known for its vineyards, some of which you will see on the hills above Tudela, La Rioja is a journey through time, and you won’t find a better season to appreciate this natural sanctuary than during the fall. The second largest town in Navarra, particularly known for its food, Tudela is also home of the Santa Maria Cathedral, a roman style church (with some gothic additions), built between the XII and XIII centuries, over the former mosque. Opening hours on week days 11:30 to 13:30 and 16:00 to 19:00. For visits and complementary informations check this website. Driving along the Cidacos river valley, a UNESCO biosphere reserve, you’ll find several designated spots with exhibits of the former presence of dinosaurs in the region, such as fossilized footprints and more. For more informations on the sites, click here. You are now in the “Cameros”. A land known in the past for its wool, where its inhabitants gladly accepted the harsh living conditions in exchange of the prosperity their trade provided. It is hard to believe today, that once the local shepherds had the ‘greater income per Capita’ in Europe, thanks to the quality of their wool. That excellence was the result of their environment, where the grass was always fresh and abundant, and the temperatures never too hot or too cold for the sheep. 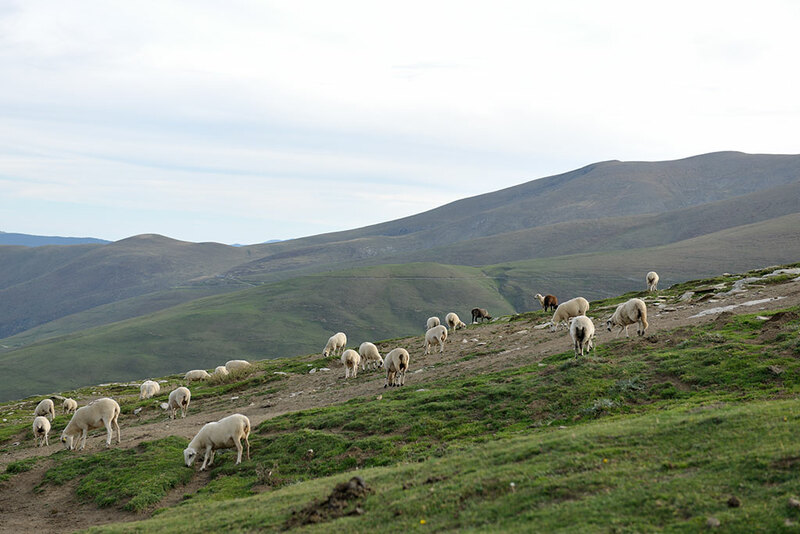 Always looking for more, the locals practiced intense deforestation to create new pastures for their sheep. But as fine wool started to lose its value because of international competition, the valley’s economy began its decline. Tranhumance activities slowly disappeared and textile factories began to close towards the end of the 18th century. All of those who had achieve great wealth thanks to the trade, some achieving noble status, began to migrate for new opportunities and resources. As a result, the forests of pine, beech, and oaks began to reconquer the lost grounds, recovering the old pastures, bringing back to the area its former natural environment and its rich bio-diversity. A place the region has decided to protect and preserve, as such creating the Cebollera Natural park. At the end of the day, as you’ll arrive at Villoslada de Cameros, check out the Cebollera park visitor center before crossing the medieval bridge and have a tour of the old village center. The other attraction around Villoslada de Cameros is the Ermita de la Virgen de Lobos de Orios. I should have taken a picture of it for you but met a couple a shepherd dogs along the way and ended spending the rest of my time playing with them. If you go up to visit the church and see them around threat them well and tell them I say Hi. The dog of the Ermitage, more interested in your food and the time you might want to spend with them, rather than keep an eye on the sheep they are supposed to look after. Forest roads not presenting any particular challenges, if for the occasional mud depending on the weather. It’s camping again. See selected spots on the attached file, including the official park campsite. The pic de Urbion and the Laguna Negra Natural Park as starter, the fortified village of Calatañazor as our final destination on this section. We move on from a purely natural exploration to a more cultural journey, that should please everybody interested in history. Sitting at 2.000 meters in elevation and surrounded by imposing granite walls sculpted by a former glacier, this small lagoon and its adjacent cascade is a great place to hike. Count the entire morning to enjoy its best spots. Warning: This park is very popular. Even in mid November during a dreadful and freezing snowy day, it was crowded. However, most people just hop on the bus from the parking to reach the laguna for a selfie, then rush back down. If you decide to climb up on foot following the torrent, and push on to the cascade and the summit of the pick de Urbion, you’ll avoid the crowds. Another lagoon (far easier to reach), this time with very pristine waters, source of the Abion river. What may look at first glance like just a small pond, is the crater of a deep underground cave that connects with an underground river some 150 meters below. The local legend has it that Undines (water nymphes) would hide in the crystal waters and uses their melodious voices to sing songs aimed at attracting young men. Once under their spell those young men were never to be seen again. The first divers to explore the cave in the 70’s, where not met by any of them but came out impressed by the beauty of the grotto nevertheless. The fortified village of Calatañazor and its authentic main street. 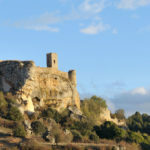 Not far from La Fuentona, sits proudly on a rocky outpost overlooking the plain, the fortified village of Calatañazor. On the surrounding fields, in what is since then called El Valle de la Sangre (the valley of blood), took place in 1002 the battle of Calatañazor, between the christian armies of the north and the muslims of Al Andalus. Almanzor, the muslim ruler, is said to have died during the battle. 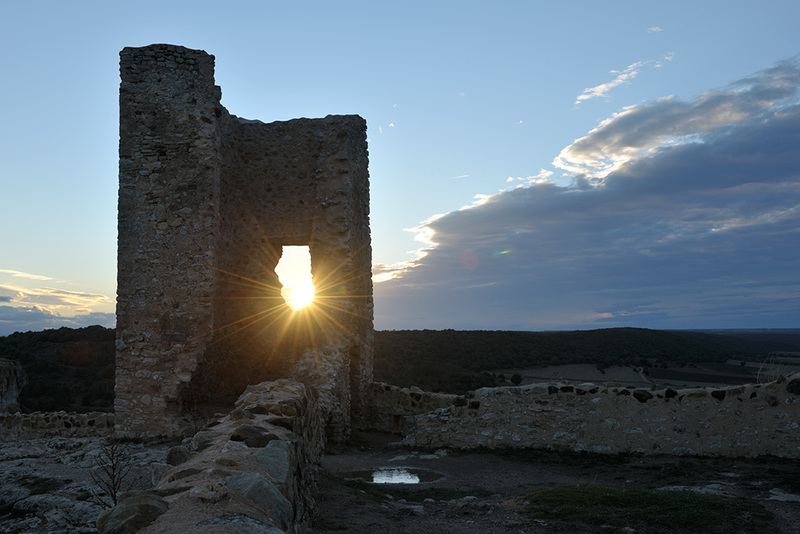 Inside the fortified walls sits a very well preserved and beautiful village, and the ruins of the old castle. Two restaurants and a small delicatessen shop specialized in mushrooms (a local tradition) are there for you to enjoy a traditional diner. Forest tracks in the morning followed by small forest roads till Calatañazor. 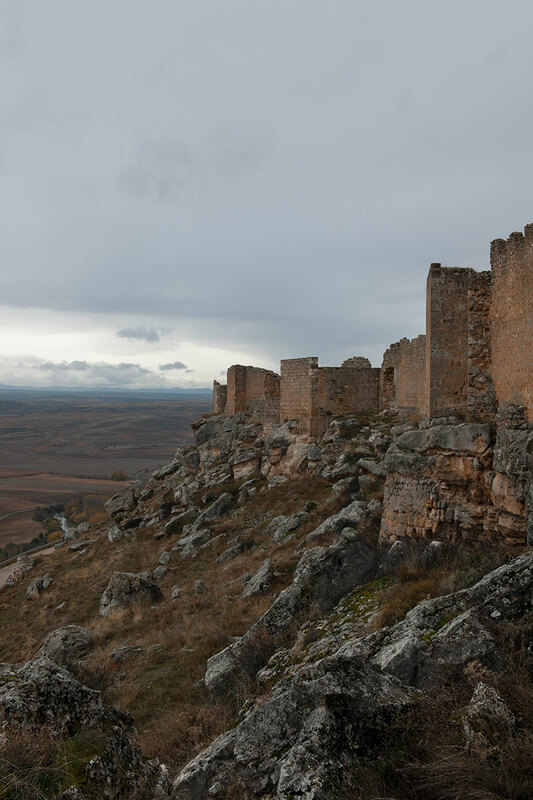 Cultural journey along the Douro (Duero in Spanish) valley, visiting the ruins of the surrounding fortified villages. As seen earlier in Calatañazor, we are traveling along what could be considered a former frontier between the muslim territories of the south and the still christian lands of the north. (The Duero river being the de facto border line between the two). That specific regional characteristic explains the vast number of fortified vestiges found in the area, some christian, some belonging to the Califate, most changing hands depending on the outcomes of successive battles. El Cid’s (local hero of that time) presence is felt throughout the journey. 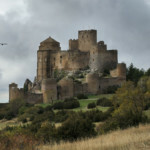 The Castle of Berlanga was built in the 15th century over a former muslim fortress. The place is in ruins, but gives a pretty account of what life in those days was all about. 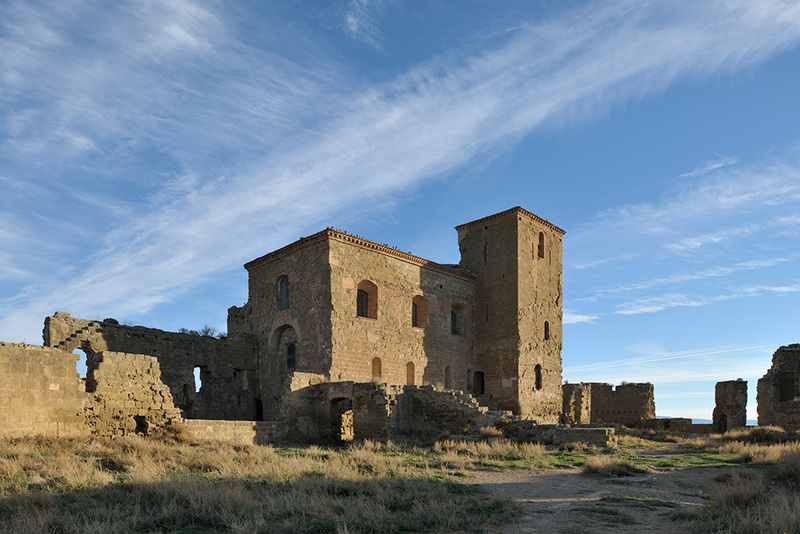 “Although the origins of Berlanga castle remain unclear, the most recent archeological excavations allow us to date it around the 10th and 11th century as an islamic fortress with no visible remains. It played a major role in the islamic front line against the christian kingdoms. in 1059 Fernado I of Castilla, in a quick campaign in the Alto Duero area, conquered Gormaz. then he headed for Vadorrey, Aguilera and finally to Berlanga where the muslims, before fleeing, destroyed the wall in several places. And this was the first part of the castle to be restored. Once the Castillan conquest was over, Berlanga began to grow, both in size and importance, until it became ‘Comunidad de Villa y Tierra’ including 33 small villages in the surrounding area. in 1370 Berlanga, which had been a royal borough, became part of the Tovar family estate. Juan Fernandez de Tovar, the first Lord of Berlanga of his family line and ‘Admiral of Castilla’ commissioned the castle refurbishment. However what exactly was done remains unknown. In the middle of the 15th century, Luis de Tovar along with his wife, Izabel de Guzman, financed the last great refurbishment of the castle affecting mainly the parade ground, courtyard and the keep, where the eight coats of arms of their ancestors were situated. After the death of Luis Tovar, his only child, Maria de Tovar, became the heiress of the estate. She was responsible for the major changes in the town and for the way the castle looks today. Around 1521, she and her husband Iñigo Fernadez de Velasco, Condestable of castille, started to build a new fortress which would surround the old medieval castle and would provide the building with more effective defences against artillery fire. In order to achieve this, they had to demolish the old medieval parts of the castle. The most experienced master builders of the kingdom of Castile were taken on, such as master Lope de Isturizaga who had worked on the fortifications of the French border. After their death, the new Marquis of Berlanga, Juan de Tovar, decided to stop the works. this allowed the old medieval castle to be preserved although it was now surrounded by an unfinished fortress. The other attraction of the town is its church, the collegiate church de Nostra Señora del Mercado, built during the XIV century in a gothic renaissance style. You can buy your tickets for the visits of both the castle and the church at the entrance of the castle. First erected in 756 AD by Abd Ar Rahman the first of Cordoba, and rebuilt and expanded a few times after by successive Khalifs, this fortress was once the biggest of its kind in Europe. Controlling the Duero valley below and protecting the Califate from potential christian insurrections. Visits are free, your only guides will be the wind and local vultures. It keeps on getting better as we go. This cathedral being one of the best religious edifice erected in the country. Started in the XII century it will receive addition all the way to the XVIII century. As such it boast various architectural styles such as romanesque, gothic, flamboyant renaissance and neoclassical. We are now in the Burgos province of Castilla y Leon, having left Soria behind. We are also on what is known as “El Cid road”, named after the famed Spanish hero. The local castle is another example of regional fortified defensive architecture to protect the town from muslim invaders. The castle was part of a wall that at the time surrounded the town. This canyon is so narrow, that at times you can touch both sides by just stretching your arms. Carved over millions of years by the Cauce river (actually, it’s more a stream than a river at this point) what was once an underground water way is now exposed. A foot path as been installed for visitors to enjoy the full length of the canyon. It’s short enough to travel back and forth. 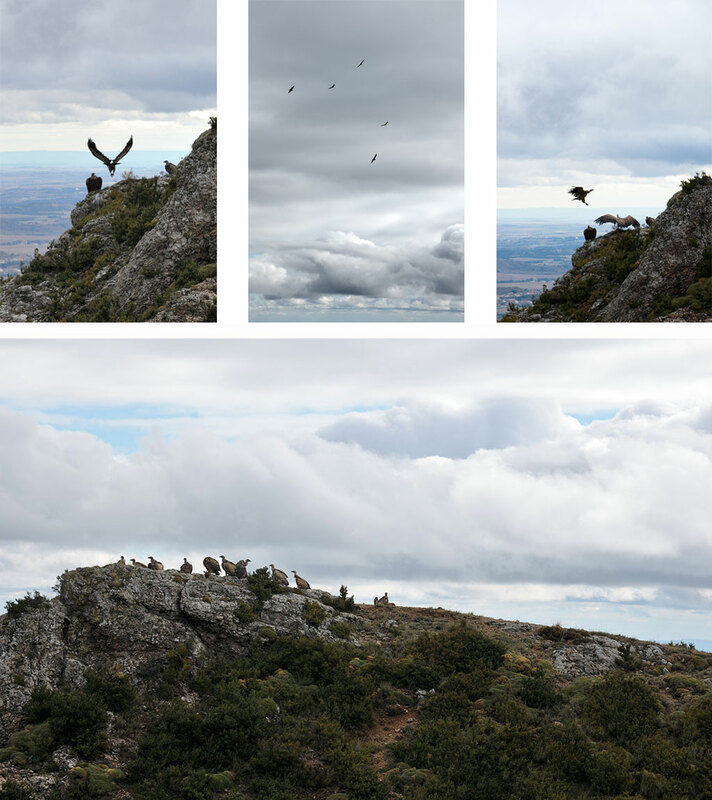 Many vultures are found nesting on the cliffs, and if lucky you can see many, many of them flying above you. Last edifice of the day. The history of this monastery dates back to the seventh century. It’s during the tenth century that Santo Domingo began the renovation and expansion of the old abbey. 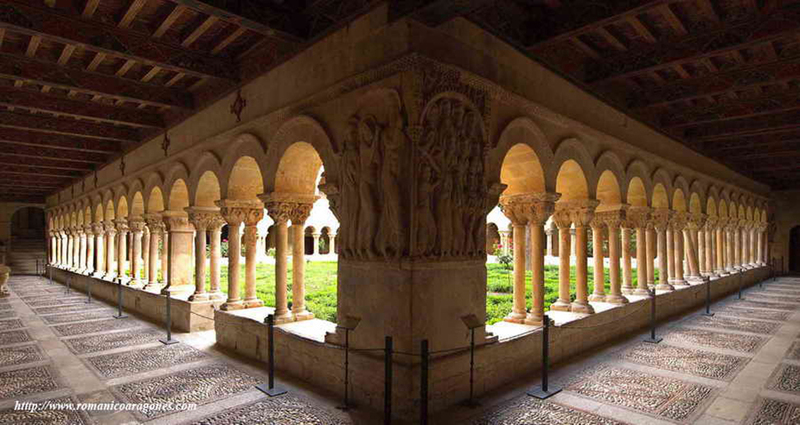 Monks have lived there since then, with a short hiatus from 1835 to 1880, when Benedictine monks from Solesmes, in France, revived the foundation. The monastery is famous for two things besides its architecture; its library and its music. We were lucky enough to enjoy one of the Gregorian concerts perform by the local monks, and strongly recommend the experience. For schedules of visits and concert, check the following link. Hotel in Santo Domingo de Silos. Last day on this first part of our Spanish Trail, taking us to the town of Burgos and its grandiose cathedral. What a treat ! The movie set of the final scene of the 1966 Spaghetti western “The Good, The Bad, and The Ugly” by Sergio Leone, starring Clint Eastwood, Elli Wallach and Lee van Cleef. Our bet is, once you start walking around it will be hard not to whistle the Enio Morricone’s music. Here is the scene for you. Also known as El Cid monastery, because the Spanish hero found refuge there in his later days and it is his resting place. “Miraflores Charterhouse (Spanish: Cartuja de Miraflores) is an Isabelline style charterhouse, or Carthusian monastery of the Order of the Carthusiansbuilt on a hill (known as Miraflores) about three kilometers of the center of the Spanish city of Burgos, autonomous community of Castile and León, in Spain. Its origin dates back to 1442, when king John II of Castile donated a hunting lodge located outside city of Burgos, which had been erected by his father Henry III of Castile “the Mourner” in 1401, to the Order of the Carthusians for its conversion into a monastery, thus fulfilling his father’s desire, stated in his will. A fire in 1452 caused the destruction of the pavilion, and construction of a building began in 1454. It is this building, which was placed under the patronage of Saint Mary of the Annunciation, which exists today. 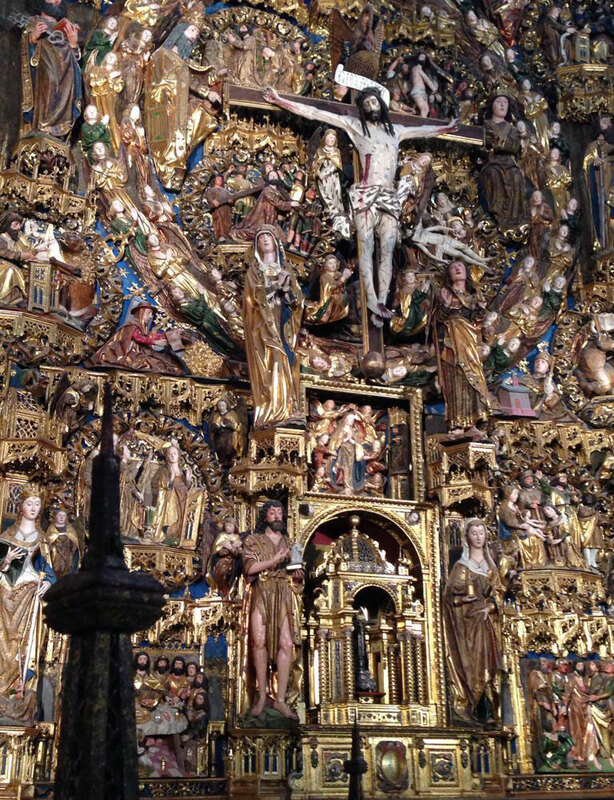 The work was commissioned to Juan de Colonia, and was continued after his death by his son, Simón de Colonia, who completed the structure in 1484 at behest of Queen Isabella I of Castile, surviving daughter of kings John II of Castileand Isabella of Portugal, whose impressive buried are housed in the monastery. As a matter of fact there is so much to say about the Cathedral that it would take a full blog post. Instead I’ll just link the wikipedia page dedicated to the church. Take the time to read about it before going for your visit. This place is one of the most amazing cathedral in the world and deserve a lengthy visit. For all practical visit informations check the cathedral website. The cathedral is probably the only site you’ll have time for arriving in Burgos late in the afternoon. Have a walk around the center of the city in the evening, and follow the visit of the city the following day. 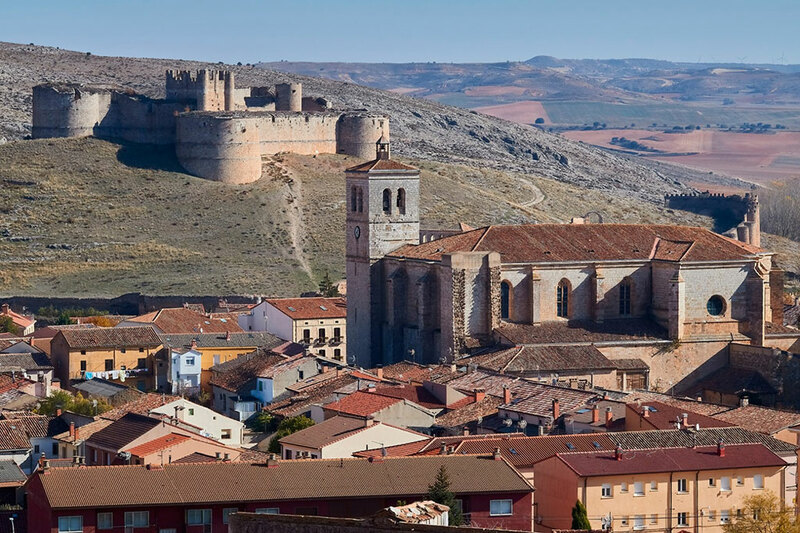 Also worth your time are the Royal monastery of Huelgas Reales, the Casa de Cordon, the Church of San Nicolas, the Arch of San Martin, the Solar del Cid, the castle hill, etc… The local tourism office will help you decide what to choose among all the sites in town. This is the end of our trip. A mix of tracks and little roads. Nothing technical today. This is the end of the first part of our Spanish trail. We wish you a safe trip, hoping you’ll be as amazed by what you discover along the way as we were. Far from the obvious attractions Spain is famous for, this trail shines a light on lesser known wonders you’ll want to come back to again and again. With this guide you’ll find our letters from Iberia in our diaries where we share our personal experience while scooting this trail. Make sure to leave your comments and feedback as we need your updates to keep this road book accurate, interesting and safe.